Around 7:15 am on Sunday, February 3, founding faculty member J. Robert Vannoy went to be with the Lord.  Bob was retired from “Biblical Seminary” for about 15 years, so I know (though it is hard for me to believe) that many current students and staff members at Missio never knew him. He was a young bachelor on Faith Seminary’s faculty. Dutch in background (and in fact he spoke Dutch fluently), he went to Vrije Universiteit Amsterdam (the Free University of Amsterdam) where he got his ThD, with his focus on the Old Testament, particularly 1 Samuel. There he also met his wife Kathe, and came onto the founding faculty of “Biblical School of Theology” in 1971. He was a protégé of Dr. Allan A. MacRae (Old Testament scholar and the Seminary’s first president), meaning that Biblical Seminary started with a powerhouse of Old Testament scholarship, which grounded the school from its beginnings in exegetical carefulness and strong biblical theology. Dr. Vannoy followed and carried out the legacy of Dr. MacRae in forwarding evangelicalism and its high view of Scripture while also embracing a generously orthodox approach to matters not clearly concluded by biblical statements. 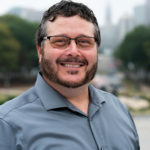 “Wherever the Bible touches on a subject, its message should be accepted as final,” Vannoy often said, but “if the Bible leaves certain question open, then Christians should do likewise.” (Both these quotations from Dr. Vannoy come from the 2002 Annual Report of Biblical Seminary, announcing Dr. Vannoy as the first recipient of the Allan A. MacRae endowed professorship). Bob was the consummate “gentleman scholar”. Keen of mind, erudite, he nevertheless approached the text of Scripture with a certain curiosity and always with humility, with a posture of submissiveness to its teachings. He responded to questions as avenues of further consideration, not as a challenge. Not just a biblical scholar, he was also a faithful churchman. In the early 1980s he actually helped plant Covenant Presbyterian Church in Harleysville as a “daughter church” of First Presbyterian Church, Lansdale. He served as a teaching elder, leader, and faithful parishioner of that church to the end of his life. He also was just a fine Christian man; and mentor to me–which included his welcoming me onto the faculty with warmth and gladness in 1998, even though everyone knew he’d have preferred a Presbyterian teaching theology . . . ; he and Kathe hosted an ice cream gathering for me at their home; and he even invited me to room with him at ETS (until I was displaced by his wife in that role five years later). Humble and careful, he published a pair of commentaries on the books of Samuel and an iteration of his dissertation, “Covenant Renewal at Gilgal”; he is not a well-known scholar, but is deeply respected by those who are familiar with his work. He leaves a great legacy of students he taught, who consistently loved and respected him and cite his teaching as having great impact on their understanding of God’s Word. I am among those. The memorial service was held at Covenant Presbyterian Church in Harleysville on Saturday, February 9th. I remember Dr. Vannoy. I still refer back to my notes and material from his class. Over the many years of ministry as a youth pastor and now a counselor I still find myself looking through my class notes from Foundations In Biblical History. I consider myself blessed to have been one of his students. Dr. Vannoy was always an encourager. Thoughtful and filled with grace. Dr. Vannoy I had met was very nice and gentle in lecture room. I never forgot his warm heart and teaching until now. Dr. Vannoy’s prayer for me, simple yet personal, during one of our meetings was instrumental in keeping me at Biblical and in ministry. And here I am 30 years later still happily serving the church of our Lord. I thank God for the life of Dr. Vannoy. Dr. Vannoy was greatly appreciated as a strong teacher by my husband Jim Wickstead who was one among the earliest students at Biblical. In 1979 I was a senior in Bible college and planning to enter seminary out West. But some friends of mine were studying at Biblical, and they seemed very happy with their choice. So, one morning I cut classes and drove up to Hatfield. 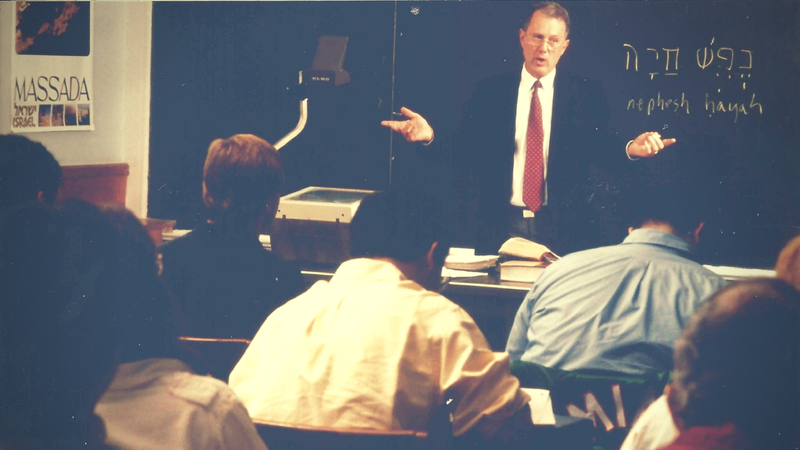 My first taste of Biblical was sitting in on Dr. Vannoy’s class on Genesis; before the end of the hour I had decided that, “This is exactly what I’ve been looking for, I’m going to study right here!” (The second visit that day was Mr. Dunzweiler’s class on apologetics and it sealed the deal). They say that much of what we take away from our professors is “attitudes and values.” In that sense, Bob Vannoy was an excellent role model for me as a student, pastor, and professor. I would list a firm commitment to the Bible’s authority; the realization that we do not have all the answers about God’s truth; the need to be irenic with other believers; the desire to help others grow; the humility to serve God without glory; a commitment to God’s people. My condolences to Kathe and the family. Over many years I have known Bob Vannoy as an able teacher, mentor, fellow church member, and friend. It was a privilege to sit under his teaching as a student at Biblical Seminary. I learned much of eternal value from his careful scholarship and personal example. He has also been a blessing to my wife and children, who will always remember his gentle demeanor and approachableness. He was never too busy on a Sunday morning to entertain their questions, and to provide thoughtful responses to encourage their spiritual growth. Carole and I also shared with Bob and Kathe a special fondness for Lauterbrunnen, Switzerland. Although, I am confident that the great natural beauty of that locale pales in comparison to his present situation. Until we meet again, my dear brother in Christ. Dr. Vannoy was one of my best professors I ever had. (1992-96). I took Hebrew 4 and most of his OT courses and profited greatly from them. He was a great expositor of the word and a very humble servant. I referred to his course notes frequently. I prayed regularly for him and his family for the last few decades. His wife Kathe was also a great encouragement to me. You can still have access to many of his course online at: biblicalelearning.org. He was a great servant of God and exalted Him always. I know his family will miss him. Blessings to them all. A truly wonderful man and teacher! I sat under him for all my theology courses. In 2014, after many years had passed since we last spoke, I wrote Dr. Vannoy requesting an article I could use as part of a tribute I was putting together honoring some of my professors at Biblical who were getting up in age. He sent me something he put together for his daughter’s wedding titled, Love and Marriage. As we corresponded via email, I could not help but notice how grateful he was for the note I sent him and his interest in receiving an update regarding me, my family, ministry… It was a blessing to have known him!